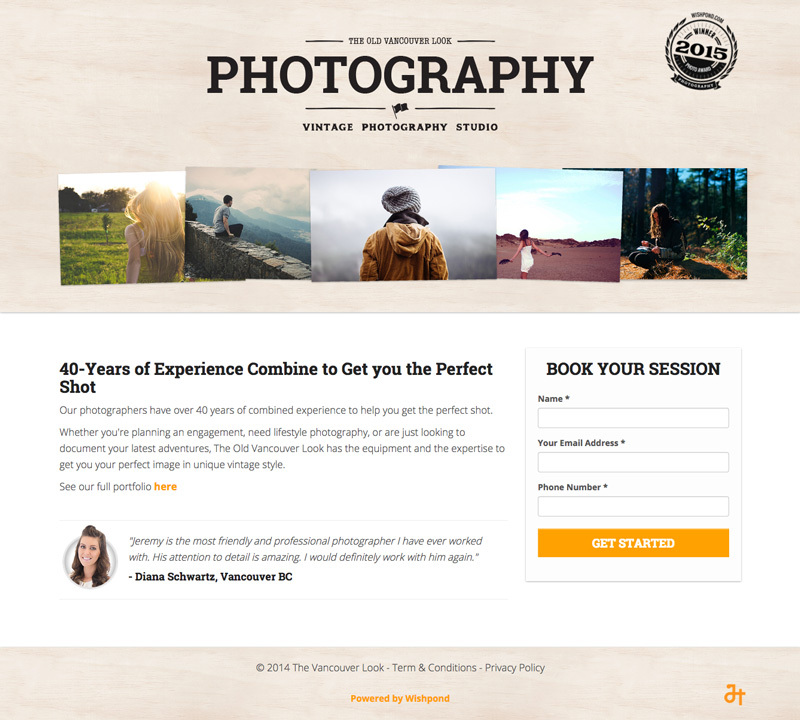 We recently did an article introducing the idea of landing pages to photographers. In it we critiqued two landing pages and provided some advice on what worked and what didn't in terms of optimizing for conversions. We thought we'd take it one step further and give you an example of what an ideal photography landing page could look like. Take some pointers from this page and you'll be ahead of the pack in terms of growing your photography business online. When users come to your page they should be able to figure out in less than 7 seconds what your page is about, what your offer is, and how it can benefit them. We played on the idea of 40 years of experience as a unique selling proposition to help differentiate this page from other Vancouver photographers. If users knew nothing about our page or our company prior to visiting, they would now know why we're unique and what we can do for them. By the time users reach your offer description, it means that they've read your headline, seen your images, and now want to learn more about what you have to offer. Now's your chance to dive a little deeper into specifically what services you provide and whom they’re for. As tempting as it might be, if you offer multiple services such as photography and DJ services, separate them for the time being as you want to make your landing page offer as focused as possible. In this form we asked for three pieces of information, a name, email address, and phone number. While other information such as event type or expected shooting date would have been useful, we wanted to make it as simple as possible for users to submit their information. Less form fields have been proven to increase conversion rates. We chose to label our CTA "Get Started" as it's very conversational and doesn't ask much of the user. Using phrases that encourage people to take action combined with a bold contrasting color is a great way to increase conversions. If you want to increase conversions, you'll want to decrease any opportunity for users to leave your landing page once they arrive. This includes a navigation bar leading to other parts of your site. By making only a few parts linkable, such as the portfolio and the CTA button, users are more likely to complete your intended action rather than wandering aimlessly around your website. Showcasing testimonials and awards is a great way to show off some social credibility especially for people who just learned about your business. We placed an award within eye sight upon arriving on the page, and a testimonial within eyesight of the form to showcase our expertise and trustworthiness during two key moments; when users get a first impression of the page, and when they are getting ready to submit their contact information. We also included a photo with our testimonial as it's been proven to boost conversions by over 100%. There you have it, a quick breakdown of what an ideal photography landing page looks like. To get started, try Wishpond's landing page builder. I hope you've found this useful. If you're interested in finding out more about how to optimize for conversions you can set up a one-on-one VIP demo.